North West anti-hunt campaigners are demanding that Tom Fell, director of the Countryside Alliance (CA) for Cumbria, condemns and expels senior members of the Coniston Foxhounds after the hunt was exposed for allegedly supporting the extremist pro-hunting group Real CA which models itself on the Real IRA. Photographs taken of the Coniston Hunt’s hound trailer on Saturday at High Yewdale showed it sporting a large Real CA poster. The news comes as a major embarrassment for Tom Fell and the CA just days before their regional gathering in Cumbria as the Coniston Foxhounds under Huntsman Michael Nicholson provided the hunt for the CA’s so-called Declaration Day at Ambleside in October 2003. The Real CA is a militant offshoot from the CA and is fronted by a former Chief Executive of the CA, businessman Edward Duke. The Real CA has engaged in numerous acts of vandalism, obstruction, criminal damage and intimidation around the country. 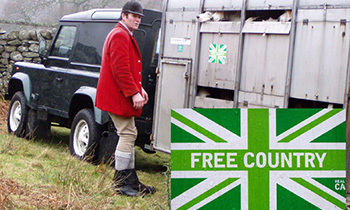 In the North West the Real CA have damaged road signs, speed limit signs, tourist signs and chevron signs with sprayed graffiti and permanent green self-adhesive Union Jack fly-posters which bear the slogan ‘Real CA’ along with a pro-hunt message. The damage raises road safety implications and has a financial impact because it will cost thousands of pounds to repair and replace the signs. Mr Duke recently said “The IRA comparison is deliberate.” He says he has organised the Real CA along the lines of the terrorist organisation, with mutually exclusive “cells” and a 12-strong ruling committee, akin to the IRA Army Council. Secrecy is adhered to, with many activists wearing balaclavas and refusing to confirm their membership. Previous threats by militant hunt supporters have included the blocking of motorways, the burning down of forests and the poisoning of reservoirs.